Uranium as a chemical element was discovered in 1789 by Martin Heinrich Klaproth while analyzing pitchblende samples from a silver mine. He named the element after the planet Uranus. In the 1800s the only use of uranium was to colour glass and ceramics. 1840 the French chemist Péligot succeeded in producing uranium in metal form. 1896 Henry Becquerel discovered the natural radiation in uranium ore from Joachimsthal. Marie and Pierre Curie 1898 found in the same uranium ore the irradiant elements radium and polonium and formed the term "radioactivity". 1927 for the first time the genetic impact of radioactive rays was detected on Drosophilidae. 1934 Maria Curie dies the aftermath of the radioactive radiation (leukemia). Research by Enrico Fermi lead to uranium as a nuclear weapon and nuclear fuel source. 1938 Otto Hahn discovered together with Fritz Straßmann the uranium's fission and so the theoretic basis of a new energy source enormous extent. With the Manhattan Project in the USA the development of the atomic bomb was forced. 1942 under management of Robert Oppenheimer the first nuclear chain reaction succeeded. In July 1945 the first nuclear explosion took place at the experimental site of Alamogordo in New Mexico (USA). In August 1945 the USA released an atomic bomb on each of the Japanese cities Hiroshima (bomb called "Little Boy" and contained 64 kg of uranium) and Nagasaki (bomb called "Fat Man"). In Hiroshima about 100,000 people died immediately, in Nagasaki about 70,000. 1946 the Soviet Union started uranium mining in the Ore Mountains (D). In September 1949 the Soviet Union tested their first atomic bomb. The atomic arms race started. Lighting four ordinary light bulbs at an experimental nuclear reactor in Idaho Falls 1951 the myth of "peaceful use of nuclear power" was started. 1952 the United Kingdom detonated their first atomic bomb. 1953 US President Eisenhower delivered his historic "Atoms for Peace" speech to the UN envisioning the creation of an international body to promote and control "peaceful use" of atomic energy and to inhibit its use for military purposes. 1954 the first atomic power station worldwide was taken into operation in Obninsk near Moscow (SU). The so-called "peaceful" utilization of atomic power started. 1957 the International Atomic Energy Agency (IAEA) is formed. 1963 the USA and USSR signed a treaty on a partial stop of atomic weapons tests. 526 atomic explosions had taken place on surface by then polluting the environment all-around earth with radioactive fission products of uranium. 1980 more than 17,000 atomic warheads existed on earth. 1985 there are 374 atomic power stations in 26 countries. 1986 in Chernobyl the so far biggest accident in an atomic power station took place. 1986 Mikhail Gorbachev submitted the Soviet proposal to abolish all atomic weapons until the year 2000. Low concentrations of uranium occur naturally in soil, granite and seawater. As uranium decays it provides a major heat source for the earth causing convection and continental drift. 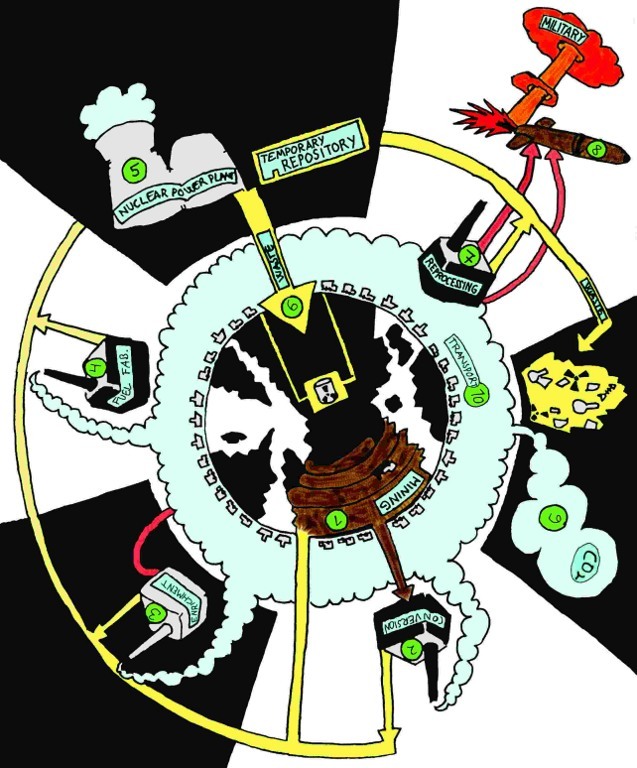 This is the story of the stages of the uranium chain and gives an overview of the threats connected to each step of the processing of that radioactive material. It starts with the mining of the uranium ore, continues with the conversion of the milled "Yellow Cake" into the gaseous UF6, then it is enriched and, in the next step, the fuel elements are fabricated. After that the uranium is used in nuclear reactors and for nuclear weapons - leaving long-lasting radioactive waste. Each stage of the uranium chain is connected to dangerous transports and the release of huge amounts of carbon dioxide. There are 92 naturally occurring elements but only one, uranium, has become the key to the operation of the nuclear fuel cycle. This singular use of uranium stems from its unstable, radioactive atomic structure. The safety problems arising from the use of uranium as an energy source stem from this highly radioactive property of uranium and the wastes it produces. The nucleus of uranium-235 has 143 neutrons and 92 protons and uranium-238 has 146 neutrons and 92 protons. The half-life of uranium-235 is 713,000,000 years and for uranium-238 it is 4,500,000,000 years. Uranium-238, unlike uranium-235, rarely fissions. But an uranium-238 atom can capture a neutron to produce a plutonium-239 atom; though, also plutonium-238, -240 and -242 are formed in lesser amounts. Depending on the uranium deposit, the ore is extracted in underground mines, by open-pit mining or by pressing chemicals containing acids and leaches into the subsoil to dissolve the uranium metal and to pump the liquids upwards (”in situ leaching”). The content of uranium in the ore is between 0.1 and 1 percent, sometimes as little as 0.01 percent. Only at a few locations in Canada uranium ore with concentrations of up to 20 percents can be found. Therefore, to produce 1 ton of uranium, typically between 100 and 10,000 tons of ore have to be loosened, extracted and processed. Uranium mining causes the destruction of huge areas; usually untouched nature on indigenous lands. Big stockpiles of unexploitable uranium ore, large tailing ponds with poisonous waste waters and the main part of the radioactivity of the mined uranium is left in the affected areas. The health of the workers and people living in the region is affected, but the environment is polluted as well. One of the most harmful decay products of uranium-238 is the gas radon-222. It is generated naturally by the decay of uranium-238 and has a half-life of 3.823 days. By mining and processing the uranium ore, it is released to the environment and causes serious damages in the human body when breathed in. In 2009, Kazakhstan, Canada and Australia were the biggest producers of uranium, followed by Russia, Namibia and Niger. Until the closure of the East German “Wismut” mine, it was the third biggest producer of uranium in the world. As the uranium supplies are running out of stock (big parts of the uranium for the fuel production is derived from disarmed nuclear weapons) a new run for mineable uranium has started since 2003. In Europe particularly Slovakia, Ukraine and Spain are targets of new uranium mining projects, while also Sweden and Finland are threatened by these developments. Ore mined conventionally in open-pit or underground mines is first crushed and leached in a uranium mill. The mill is usually located near the mines to reduce transport. The uranium is then extracted in a hydrometallurgical process. The final product produced from the mill, a powder consisting of a mixture of different uranium compounds, is packed and shipped in casks. Commonly this uranium ore concentrate (U308) is referred to as “Yellow Cake”, named after the colour of one popular type of this concentrate. Two tons of mined ore will yield approximately one kilogram of this material. The residues (tailings) from this uranium extraction are always radioactive and need to be disposed of "in an orderly way". Due to their huge amounts and the long radioactive half-life of the remaining thorium, radium and uranium isotopes, these constitute a long-term environmental problem. The next stage of the procedure is the conversion of the uranium ore concentrate into the solid UF6. In Ekaterinburg (RUS) and Pierrelatte (F) as well as in Lancashire (UK) conversion facilities are in operation. Several other countries also operate such plants. The concentration of the fissile uranium isotope -235 in natural uranium ore is not high enough for the use in nuclear power plants. Usually, the share of uranium-235 is 0.7 % while some 99 percent of the natural uranium is made by the not fissile uranium-238. Thus, the concentration of uranium-235 has to be increased for the usage in the so-called “light water reactors” to enable a nuclear chain reaction - the uranium has to be enriched. Technically, there are different methods of uranium enrichment. One of the most common techniques is the separation of the uranium isotopes by gas centrifuges. In Gronau (D) an uranium enrichment facility with gas centrifuges is in operation and produces fuel for some 20 nuclear reactors. An extension of the factory’s capacity is planned to enrich uranium for 32 big nuclear reactors. Further unranium enrichment plants are situated for example in Tricastin (F) and Almelo (NL). The UF6 is reconverted into UO2, milled to uranium powder and pressed into pellets of 10 to 15 mm length and 8 to 15 mm diameter. These are sintered at a high temperature of about 1700 °C to form a ceramic material, reground mechanically and filled into zircaloy cladding tubes. The ends of these tubes are welded up. A larger number of single rods (up to 250) are joined together to form a fuel element. Examples for nuclear fuel facilities are the sites in Lingen (Germany) and Dessel (Belgium). The usage of uranium as fuel in the nuclear reactor is only one of many stages in the uranium chain. The nuclear fission in the reactor produces hot steam that is used to generate electricity in turbines. During the operation of a nuclear power plant radioactive particles and radiation are released to the environment. Additionally, big amounts of radioactive waste are produced in form of the spent fuel by a nuclear power plant that have to be disposed permanently or are going to be “reprocessed”. Accidents like the catastrophe 1986 in Chernobyl are an unacceptable risk for human beings and the environment. No reactor can be operated safely. 436 nuclear reactors were in operation in 2009. Independent of the question whether the nuclear waste will be shipped to a final disposal site or treated in a reprocessing unit, a temporary disposal of the spent fuel is necessary. For this reason each nuclear power plant has its own temporary repository. The spent fuel elements are stored for a couple of years in a spent fuel storage bay. Many nuclear reactors have an additional dry storage repository to store the fuel elements for further years. These repositories increase the threat, because the amount of radioactive inventory is raised and the effects of accidents or incidents would be much higher. In each stage of the uranium chain nuclear waste is produced. A normal nuclear power plant with a capacity of some 1,300 megawatt needs at full load approximately 33 tons of enriched uranium a year. To produce this amount of fuel about 740,000 tons of rock have to be moved. Almost 620,000 tons of it are left as partly radioactive overburn in stockpiles in the mining areas. Only 120,000 tons of uranium ore are processed in the next step. Here some 123,000 tons are left as radioactive and toxic sludge in the uranium mines’ tailing ponds. Some 280 tons of uranium ore concentrates are converted into 348 tons of the gaseous UF6, leaving another 165 tons of solid respectively 153 m3 of liquid nuclear waste to be stored temporary for later final disposal. The uranium enrichment leaves some additional 305 tons of depleted UF6 to be disposed or used for military purposes. Not more than 43 tons of enriched UF6 are processed into 33 tons of UO2 to end up as fuel for a nuclear reactor. During operation of this plant, high level it turns into nuclear waste and additional radioactive material is created that has to be disposed. During all these stages of the uranium chain the amount of nuclear waste has been duplicated, because most of the materials in contact with the radioactive substances have also become radioactive and have to be disposed as low or intermediate level radioactive waste. Nowhere in the world a safe final repository for the long-lived nuclear waste exists. It is very likely that there will never be a safe solution for this harmful material as it is not possible to make accurate assumptions to design a safe final repository for millions of years. No one can calculate detailed projections of geological or even social developments for such a long time. Today, the uranium waste is stored in huge stockpiles of radioactive overburden and big toxic and radioactive tailing ponds in the mining areas, in temporary repositories close to the processing facilities, dumped in certain areas of the world (e.g. German uranium waste was shipped to Russia for a long time) or it was stored in well-known unsafe disposal sites for radioactive materials. The chemical procedure for separating plutonium or fissionable uranium from spent nuclear fuel is called reprocessing. About 10% of the spent fuel that is produced worldwide is being reprocessed. Reprocessing plants around the world - e.g. in La Hague (F) or Sellafield (UK) - have exhibited poor records of occupational safety, pollution control, waste containment, and security. Reprocessing was developed decades ago when the nuclear industry planned to use the separated plutonium in fast breeder reactors. Due to problems with economics, safety and technical issues the breeder story failed to succeed. Despite this failure, reprocessing still continues in Europe and Asia. Plutonium, of which only a few kilograms are enough to produce a nuclear weapon, is now for a small part used in so called MOX fuel. MOX increases the dangers of nuclear proliferation, as the plutonium in it is easier to extract for weapons use than plutonium in spent nuclear fuel. In order to use MOX fuel, the reactor must be adapted. These changes lead to smaller safety margins when the reactor is switched off and the fuel rods are damaged sooner. The rate of fission of Pu tends to increase with temperature. This can endanger reactor control. Besides the limited re-use of Pu, the nuclear industry claims 95% of the reprocessed uranium is re-enriched and used again in fuel. However, this is the theory. In reality only a small part is re-used. Uranium enrichment is also an explosive topic of military policy. In principle, enrichment plants such as the one in Gronau (D) can also produce weapon grade uranium. This is uranium enriched to a degree that it consists to 70-90 % of U-235. Officially, Gronau is so far only allowed to enrich up to "civil" 5 %. A higher percentage could surely be reached after some reconstruction. But not only the enrichment facilities provide the military with deadly materials: in reprocessing units like La Hague (F) plutonium is produced that can be used for nuclear weapons. That was the original usage of these plants, shown in France by the term “l’usine de plutonium”. Since the 90s of the last century the military of several countries like the United States or Great Britain uses depleted uranium (DU - the by-product of the enrichment of uranium-235) to strengthen the effects of their weapons. When the uranium weapons explode a fine powder of uranium dust is released and spread. During the last decade, DU ammunition caused heavy health issues and casualties among affected soldiers and residents in the attacked areas. Nuclear power is not carbon neutral. Mining the uranium ore, processing it, the conversion of “Yellow Cake” into gaseous UF6, the enrichment of uranium, the re-conversion of the UF6 into uranium oxide and the following fabrication of fuel elements eat up a huge amount of fossil energy. The worse the grade of uranium ore, the higher are the efforts necessary to produce the fuel. Even today, each kilowatt hour of nuclear electricity is connected to some 32-65 grams of carbon dioxide released to the atmosphere. Other studies showed up to 159 gram CO2 per kilowatt hour nuclear electricity. Most renewable energy sources produce less CO2 or comparable climate-relevant emissions. Even modern block heating and generating plants cause less climate issues than nuclear power. Besides for processing the uranium to produce fuel elements much energy is used in the construction of the nuclear power plants and supplying facilities need much resources and energy, as they have to be very strong because of the risks connected to the operation of a nuclear plant. This energy is generated mostly by fossil sources. Additionally, the nuclear fuel cycle produces greenhouse gases like HFCs (e.g. emitted by the nuclear facility Sellafield) thousands of times more potent than carbon dioxide. Connected to the development of nuclear fuel for reactors out of natural uranium a huge number of transports are necessary. Each shipment is connected with the danger of accidents or mostly harmful attacks as well as to the release of a big amount of climate-relevant gases. Also, the transports increase the radiation exposition of residents, drivers, guards and other people passed by the shipments. Transportation is necessary to move the uranium ore and the processed products from one facility to another, to move the nuclear waste from the power plants to the repositories or reprocessing units and to ship other supplies and materials for these activities to the right places. Together with the processing of uranium, the transports are most responsible for the bad climate balance of nuclear power plants. Nuclear transports are largely done by truck, ship or train. Thus, the local communities of certain seaports, train stations and highway routes are affected by these dangerous shipments. In Germany the transport of high level radioactive waste (so-called Castor transports) to the temporary repositories in Gorleben or Ahaus is again and again leading to the resistance of thousands of people and is pushed through by the force of thousands of police. Download this text as a flyer (A4, 4 pages, 600dpi) in English, Finnish, German or Russian. This is also available as presentation in English and German. Finde more articles about Uranium on the Nuclear Heritage Network webpage. This page was last modified on 21 February 2017, at 16:30. This page has been accessed 59,552 times.